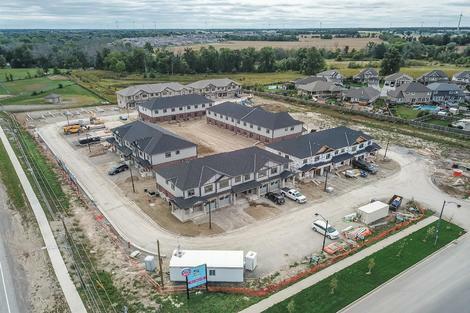 Welcome to Stepping Stones in Smithville by Phelps Homes LTD. 54 family-friendly townhomes set within the neighbourhood of Streamside on Twenty Mile Creek. "The Granite" is a 1535 Sq ft end unit with fully finished basement. 4 plans to choose from altogether, all featuring 3 bedrooms, 2. 5 baths & single garage. Taxes not set. Condo fee is approx 103/month & includes landscaping all common areas, all lawn irrigation, grass cutting, snow removal, garbage pickup, street lights & visitor parking. Please note: Photos are taken from a similar unit - Buyer to choose their own finishes from the Builder's samples. 90 day occupancy available. Recreation Room 19'11" x 12'4"
Great Room 11'4" x 18'2"
Master Bedroom 12'0" x 14'0"